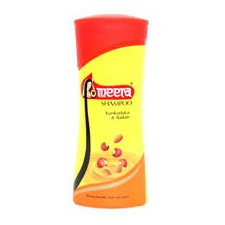 Buy CavinKare Meera Badam Shampoo with Shikakai, Reetha makes hair stronger, healthier, thicker, shiny and soft hair. Meera Herbal Shampoo with Badam offers two variants of Shikakai and Kukudukai (Reetha) along with badam. Shikakai is known for its cleaning and anti-dandruff properties and reetha, a gentle cleanser makes the hair soft and shiny. Meera Badam Shampoo is rich in natural badam protein which nourishes and conditions your hair. It is natural and mild on the scalp and makes the hair stronger and healthier. It is available in both sachets and bottles. Meera Shampoo with Kunkudukai(Sapindus Laurifolius) and Badam is a natural and healthy means of haircare. The Shampoo is enriched with Kunkudukai, a traditional herbal ingredient which cleans the hair gently and ensures that the hair is made healthy and soft. Badam has been added to nourish the hair and make it stronger, thicker and shine with luster. This unique combination of kunkudukai and Badam is rich in protein and hence moisturizes and deeply conditions the hair strand by strand.